Communicating on Social Media: As American as Apple Pie? – Media! Tech! Parenting! Communicating on Social Media: As American as Apple Pie? The Pew Internet and American Life Project recently published new social media data, this time asking why American adults use social networks. From my point of view, keeping in touch with people is a grand old American tradition, as traditional as apple pie. Over the years whether it’s over the backyard fence, via snail mail letter, postcard, telephone, or e-mail, Americans like to connect and communicate. 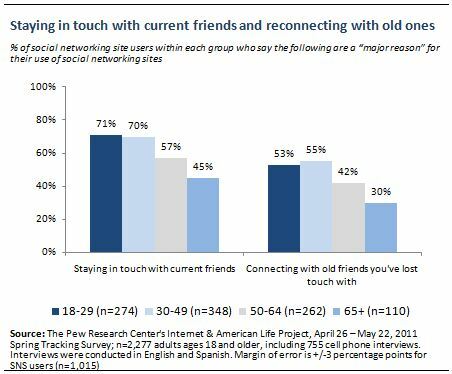 Interestingly, according to this new Pew data, adults become involved with social media — Facebook, Twitter, Linkedin, and others — because of the ease of keeping in touch. People use a social medium if it makes communicating with friends and family easy and fun. Next Post Relying on a Resume? Think Bigger!